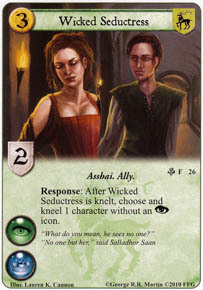 Response: After Wicked Seductress is knelt, choose and kneel 1 character without an Intrigue icon. Flavor Text: "What do you mean, he sees no one?" When the Wicked Seductress (RoR) kneels to attack, I can use the response? I just want to be sure. Yes, as she knelt. It doesn't check why she knelt, only that she was knelt.